Tarzan returns to Africa to defend his jungle from both human and supernatural foes alike with a little help from his friends, including in one episode Carson Napier of Venus, who's also authored by Tarzan's creator Edgar Rice Burroughs. During a solar eclipse in the land of Zadu, Tarzan risks having an evil spirit overtake him and other members of the Zadu tribe. La - High Priestess of Opar helps with the solution. The series begins with Tarzan, still living in Europe, returning home to Africa to foil the plans of the evil Count Rokoff. 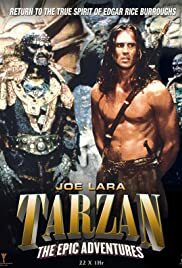 After defeating both Rokoff and his accomplice, Mora, queen of the flesh eating monsters known as Mahars, Tarzan decides to stay in Africa, and is reunited with his old friend Timba, who joins him in his adventures. A well made attempt at showing us the Tarzan from the Edgar Rice Burroughs novels.